Last weekend we made a trip to Cincinnati for a short Fathers Day visit with my dad. Having been rained out on our Father/Son/Grandson fishing trip Saturday morning we quickly moved to the Plan B activity. 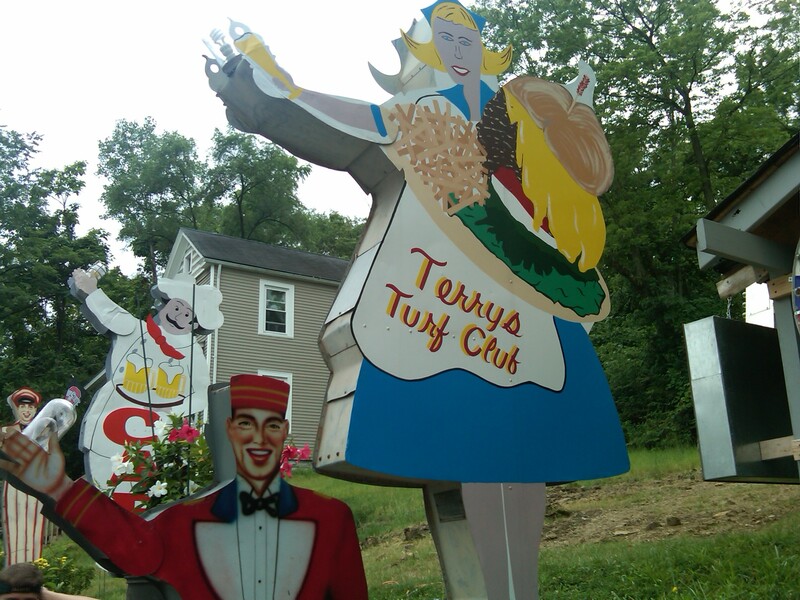 Located in the East End/Mount Washington area of town sits what some could say is a neighborhood eye sore but in this case Terry’s Turf Club actually improves the otherwise run down neighborhood. As we drove to Terry’s for lunch I could not help but wonder if there was a mugging in my future. When you see couches on the sidewalk and mattresses in the front yard you start to realize you might be in the wrong neighborhood (or we missed one hell of a party last night). With it’s abundance of neon lights (inside and out) and motorized arm-waving signs it’s impossible to miss this place. Diners Drive-ins and Dives did a segment in 2010 and the restaurant looked very intriguing. I’m not a Guy Fieri stalker by any stretch of the imagination but I’ve been to a few places featured on his show. There’s a lot of disagreement on the Internet about the places he picks, etc. but so far I have to say he’s exposed some gems to the Food Network audience. Back to Terry’s… We arrived around 2pm and there was a small group of people standing around outside. We lucked out and scored a parking spot right in front of the place (including a perfect parallel parking job if i say so myself). There were cars lined up and down the street a good 200-feet in either direction and a light drizzle was bringing people in under the awning. We added our name to the list and settled in for a 30-minute wait (my limit to wait for ANY food by the way). I’m curious if the DDD exposure contributed to the popularity of Terry’s or if it’s just one of those places that draws a crowd on its own. My dad brought out a bowl of in-shell peanuts for the kids (and us) to help pass the time. We watched groups of people going in and out of Terry’s and those exiting all looked happy. My dad asked one lady how it was when she came out and she answered “wonderful”. It was our turn to be seated & we were placed right inside the door at a tall 4-top that was converted to a 5-top. A little cramped but workable, plus it was right next to the electronic jukebox with 5 song credits ready to be picked and played. I’m not a fan of the raised chair/table combo and prefer having my feet on the floor when I eat but I’m not going to let this ruin my experience. Neon signs are definitely the predominant decor at Terry’s. The menu at Terry’s is simple yet complex. They are known for their burgers and the vast array of toppings, some of which are surprising (Fioe Gras, Halloumi Cheese, Crab, Pate, Scallops…). If you’re not careful your $8.00 burger could easily exceed $15. 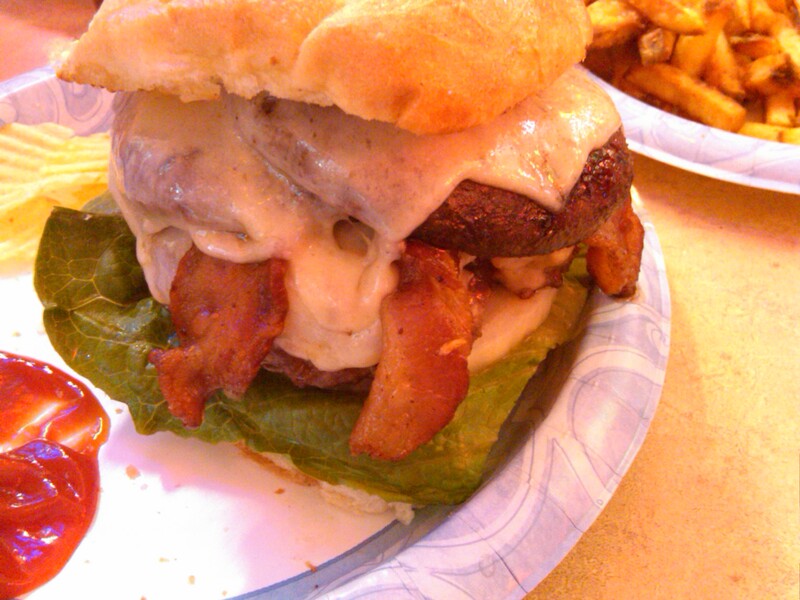 I went for the Burger (medium), Bacon, Swiss, lettuce, raw onion & a portabella cap ($10.75 total). My son ordered a similar combo but with shitake mushrooms instead. My dad ordered a burger with Brie (one of my least favorite cheeses no matter what you pair it with). The girls ordered their burgers and we split 2 orders of fries among the table (plenty of fries by the way). 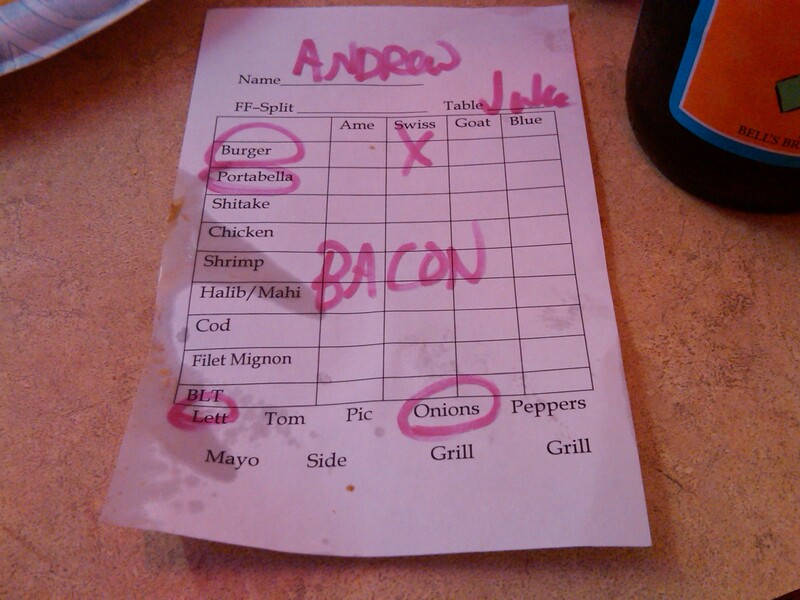 Each food order was written on it’s own slip and your name was added to the top for good measure. After we placed our orders and selected a few songs on the jukebox it was time to start looking around the place in a little more detail. There could not be any more than 40 people in the place and the noise level was a little high. If you are thinking about bringing kids here be sure they can take a little noise without being uncomfortable. I was a little concerned about how our son would react to the chaos (he’s not a loud noise fan) but he was a trooper. Unfortunately the humidity, air conditioning, and exposed HVAC ducts right above my left shoulder resulted in a few shockingly cold drips during our meal. Nothing major but a little annoying nonetheless. After the mixed reviews on Urban Spoon I was wondering how long it would take for our food to arrive. 10-15 minutes passed & our orders were delivered (not bad at all) . All burgers were all cooked & dressed as requested & the fry’s looked great! Everything was served on paper plates & the forks were plastic. If you want a knife to cut your burger they bring you a giant slicer and return it to the holder on the wall after you use it. I doubt Terry has a dish washer on his staff since the only thing that needs to be washed are the tables and the soda cups. This was a little surprising considering the price of the food and toppings. But, if you look at it another way, this definitely cuts down on the table turnover time which is important when you have a constant line of hungry patrons. None of the customers really seems to care and it was served that way when DDD was shooting the segment. The burgers were good really good. Cooked to order, dressed to order and generous in size. Lots of “Yums” at the table as everyone dug in and took the first bite of their sandwich. I was surprised to find not one but TWO nice-sized portabella caps on my burger. This created a mushroom to beef ratio nearing 1:1 and required the jaw separating ability of a snake. A little squish, lots of juice, and some trial and error finally got this burger in my belly. If I had one “complaint” it was the little-to-no seasoning of the portabella caps. Everything else was spot on. A little seasoning on the mushroom would have gone a long way. Having tried a bite of my son’s (seasoned) shitake topped burger confirmed this suspicion. Throughout the meal the staff was attentive and everyone had a good experience. The check came & totaled just under $100 (5 burgers, 2 fries, 3 sodas & 3 beers). A little steep but not unexpected after reading various reviews online. 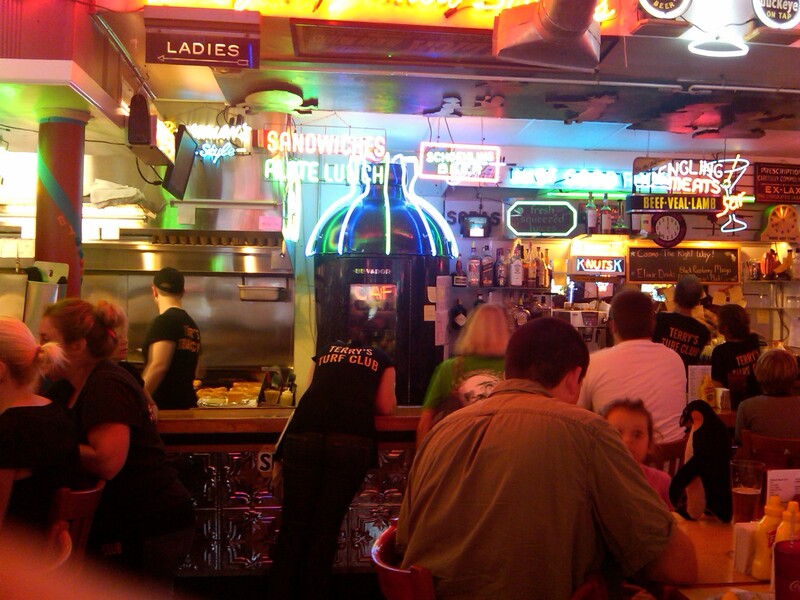 Terry’s Turf Club was a great change from the “normal” burger joint. It’s quirky, uniquely decorated and efficiently run. The burger “accessories” are over the top and the location is a little sketchy. This it all works to give residents and visitors alike something to talk about when discussing good food in Cincinnati. Besides, how much can be said about Chilli, and don’t get me started about my disdain for Goetta. We’re going to be back in the area soon and I’m going to seek out Zip’s which I hear is the local competitor to Terry’s Turf Club. I’ll be sure to write up a review of that one as well.